These canvases are an extremely powerful way to enhance your home. On this page Canvas Boutique attempts to give you some more detail so that you can relax in the knowledge that you have made the right decision with your purchase of these highly collectable images. 1. The nominal 45mm or 35mm edge of these wraps can be produced in black, white (i.e. canvas colour), or as a repeat mirror effect of the edge of the image so that none of the picture itself is lost. This effect can be very striking. Some images look fantastic with a black edge and others, say lighter images, suit a white edge to the wrap. Your decision here will be swayed by your wall colour or just personal preference. A small surcharge may apply for awkward wraps. 2. 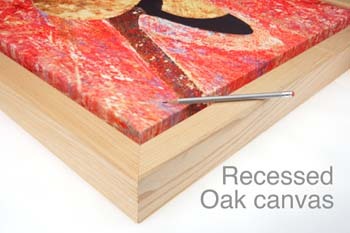 Canvases can be supplied with security fixings that require a special spanner (supplied) to remove your canvas from the wall so no one will be able to remove it freely. The canvases can be hung conventionally if you prefer and this is very straightforward. 3. Dye Sublimation is a very permanent process that converts the ink into a gas on application with heat and pressure. It is extremely high quality and is durable and lightfast. 4.Obviously normal precautions when displaying and handling are advised. 5. Occasionally there can be a slight overlap of the image onto the sides of the wrap frame. This is normal and is due to the variations of stretch in different canvases, it being a natural product. It in no way detracts from the appearance and is part of its appeal. 6. Each image that you purchase is signed by Trevor Burrows along with a certificate of authenticity and its Limited Edition number. If it is not part of a limited edition for any reason you will be informed. Occasionally guest photgraphers will appear on the site and their work will be available to purchase in the same way.